As Kevin Durant nears free agency, his decision is as unclear as it was at the beginning of the season. So, any rumors and potential connections to other teams will raise eyebrows, such as the fact that Durant will receive a virtual tour of Brooklyn from D’Angelo Russell via his new video series, “Fly By,” along with San Francisco and Los Angeles. Would KD leave the Warriors? It’s a bit strange for LeVert to tout Brooklyn as a destination in which Durant could play with other superstars, considering that KD is currently at the Golden State Warriors, a team that boasts a luxury of star talent. 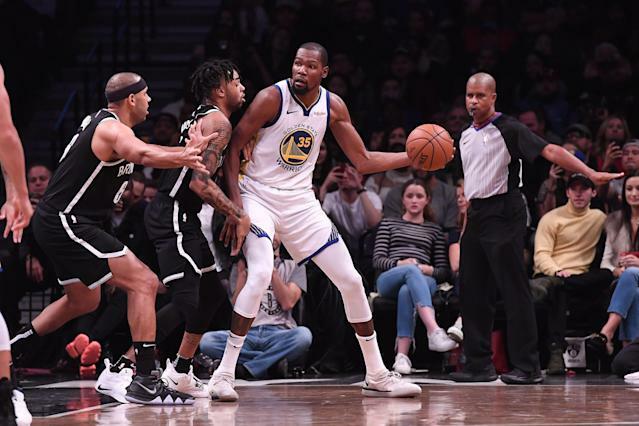 Unless Durant is seeking a change of scenery, playing for a team like the Nets or the New York Knicks will mean surrounding himself with a considerable drop-off in talent from his current situation. There have been hints Durant is unhappy in Golden State, starting with his blow-up with Draymond Green during a game in November and continuing when he lambasted the local media last month after not speaking with them. And so, rumors will continue to swirl until Durant affirms he wants to stay. A conversation caught on camera between Durant and Kyrie Irving over All-Star Weekend blew up on social media, with lip readers wondering if they would both sign with the Knicks — who have two max slots this offseason. It is unlikely Kyrie and KD decided to team up at that very moment, just like it is unlikely that Russell giving Durant a virtual tour of Brooklyn will convince him to play for the Nets. But such is the reality of today’s NBA free agency craze, and our insatiable appetite to connect any hint with a potential decision. Durant has kept saying he just wants to play basketball, but as the summer nears, the noise will be increasingly hard to block out.